Which Laser Caps are FDA Approved? One of the most important things you need to check before buying a home hair growth laser cap, is the FDA approval. You would not want to use a device for six month and find out is didn’t have an FDA approval. The Food and Drug Administration is the reliable and main administrator you need to check to see if health related items are safe for you. By the way European community have a similar administration which issues a CE certificate, which is similar to FDA clearance, but each administration has different standards and evaluation points. For items you buy in the USA you should only seek the FDA approval for it has insurance and legal aspects too. In the post below we will share crucial and important review about the best laser hair growth caps which you may not find in other places! 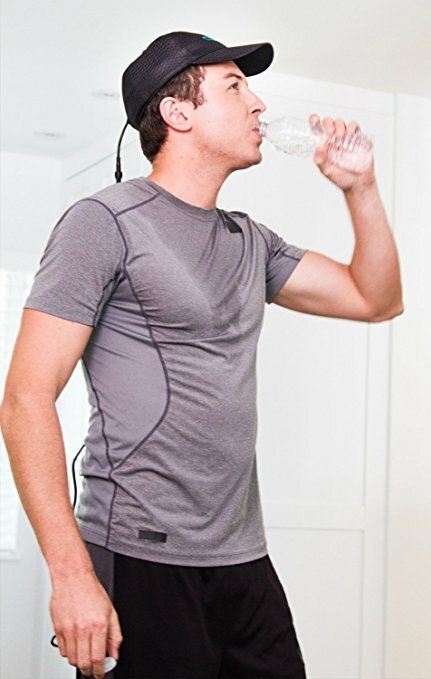 Many sites which review these hats and helmets just mention a general FDA approval when they refer to the home hair restoration caps, but the truth is a little different. Some caps and laser helmets have only a partial FDA clearance… This is usually not written in bold letters like the rest of the marketing fluff. Not having an FDA clearance does not mean the device will cause you direct damage, or health issue. It just mean the manufacturer has not completed the approval process, or did not manage to show the FDA documentation of clinical trials which prove effectiveness and safety. Non of the home laser hair growth caps and helmets have FDA clearance for treating people with dark skin. 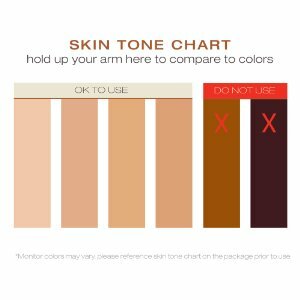 All the current clinical trials have been done on people with white complexion skin types, called in the professional language Fitzpatrick Scale 1-4. These are the four colors you see in the left bars (below). People with darker skin similar to the two bars on the right side, have not been participating in the trials, (of not in numbers to be able to analyze results from) so the FDA did not cover its clearance for them. There is a slight risk (which was not checked so it was not overruled) that laser light might have an unwanted effect on dark pigmented skin. This is because dark pigmented skin turns light into heat. If the laser LLLT (low level laser therapy) hair regrowth technology was not tested over dark skin, the FDA can’t approve it. It might be tested and found OK, or tested and found dangerous or tested and found that the treatment plan need to be updated. But until it is tested, non of the home laser hair growth caps, hats, and helmets are cleared for people with dark skin. This applies to men and woman. One of the first laser hair growth helmets introduced to the general public market was the Theradome. With CEO and inventor former NASA scientist Tamim Hamid, the Theradome attracted lots of attention. It boasts its FDA clearance and approval on the main home page. The Theradome brought hope and results to many people men and women with hair loss problems. Being one of the first laser therapy solutions at Amazon for balding and customers with hair regression. It has 80 laser diodes places in the internal side of the helmet. 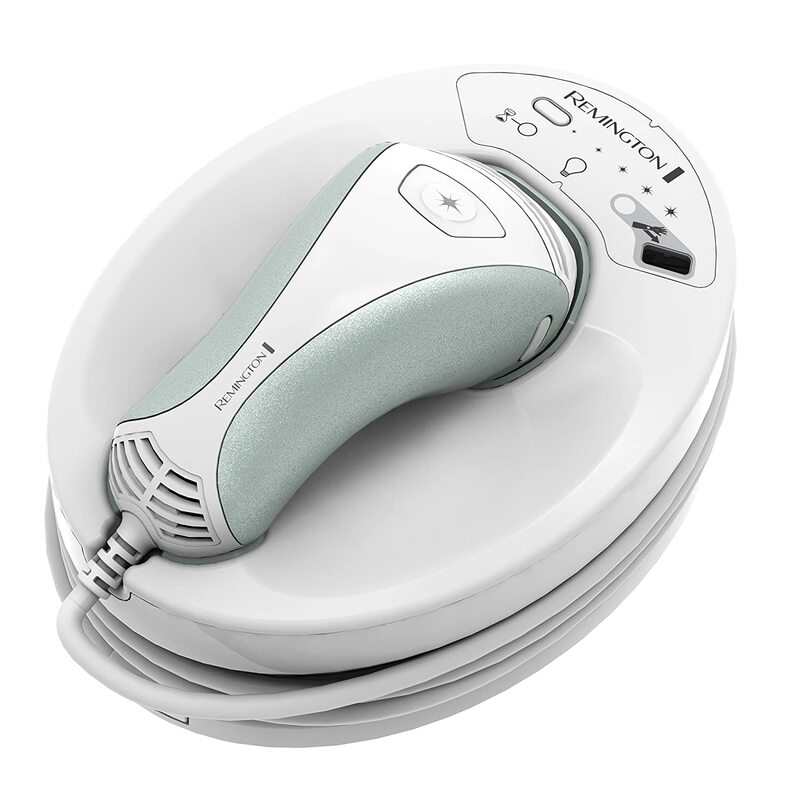 It is portable hair growth device, meaning it operates on batteries and the user can walk around not not be connected to the AC power while using it. Regarding the Theradome FDA clearance – The Theradome has been cleared by FDA only for women. You can see below a screenshot from the FDA clearance Section 4. In spite of this, the LH80 is also used by males with thinning hair and hair loss patterns, some of which noticed results. 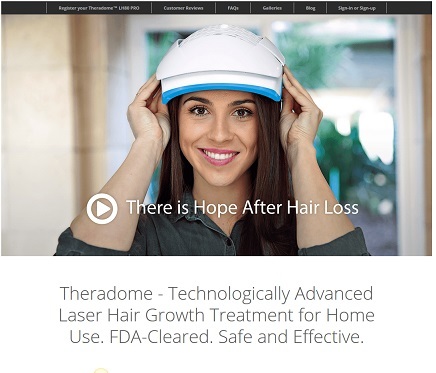 According to the FDA clearance Theradome should not market the device ‘for men’ and as you can see in it’s home page, the presenter is a women. 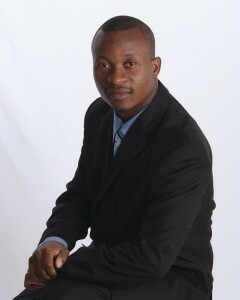 Click here to read reviews and check current ratings given to the Theradome by other customers. One other helmet which due to a lower price is ranked higher in the Amazon sales rank, is the iRestore hair growth helmet. The iRestore laser helmet has slightly different features from the Theradome. It uses both laser diodes and non-laser diodes which are actually LEDs. If the Theradome had 80 real lasers the iRestore have 51 light spots spread inside the helmet. 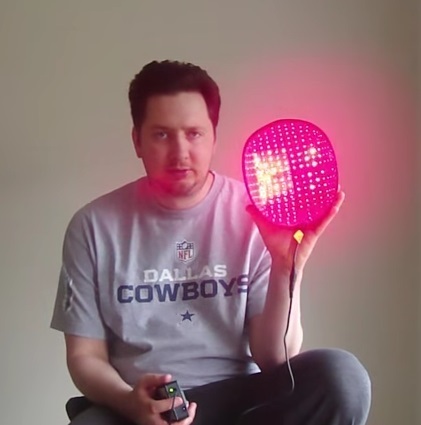 Of these spots only 20 are lasers and 31 are red light LEDs. Both the lasers and the LEDs work on the same wavelength of approx 650 nano-meter, which is the common wavelength of ‘low level laser therapy’. Part of the FDA clearance process is showing a device is similar to an approved technology. This helps the FDA approve the application with less hassle. If technology of brand A had passed FDA and a manufacturer of brand B brings the same technology, then the clearance process is based on clinical trials already shown for brand A. In the case of the iRestore, they placed their new helmet request for FDA approval based on former helmets with the same specs that were already approved. 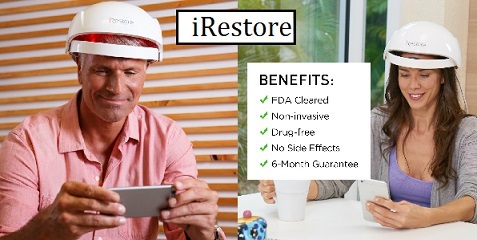 As you can see below from the FDA 510(k) – The iRestore is IDENTICAL device to the iGrow laser helmet in terms of optical and electronic function. All the technology is the same except the design and the audio earphones. 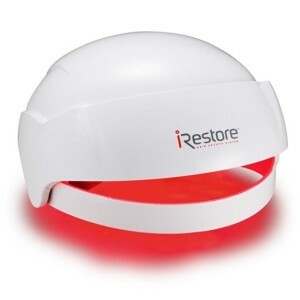 Without the portable capabilities and with less lasers inside the helmet, the iRestore has very good customer reviews, and ratings at Amazon. It might be that the lower price makes it more affordable and reachable for many men and women than the premium 80 lasers caps and helmets. Click here to see the reviews and ratings users gave the iRestore laser hair growth system at Amazon. The Capillus laser caps are probably the best hair growth laser systems you can find at Amazon. As you can understand from their name, one has 82 lasers and the other has 202 lasers packed inside their cap. It’s a cap is not a helmet! It has a casual everyday sports cap look. Which makes them more appealing to be used by people with hair thinning and hair loss, who may already be uncomfortable about their hair and the need to be dealing with it. Most people would feel more comfortable wearing a regular cap than a “helmet” if they were to wear it outside, even if it was only in their backyard. The second advantage is that the Capillus has the lasers spread evenly all around the inner part of the cap, so it can beam the laser and cover more of the head than the Theradome, iRestore and iGrow which all have the lasers (or LEDs) placed at the top third of the helmet. See the comparison below how the Capillus 82 lasers are more evenly placed. As mentioned above, once one item is cleared the other items just need to prove they are using similar technology. 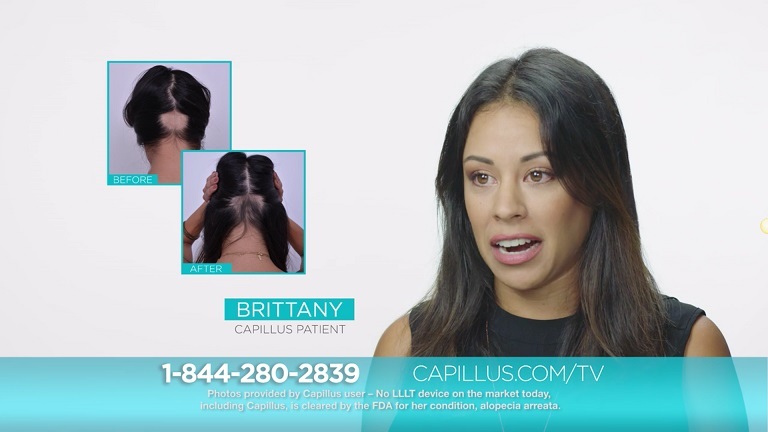 The Capillus caps are FDA cleared for both men and women, who are in the right candidate group, for hair loss patterns and skin color tones. They have cleared both the home systems and the professional office domes, as they all use the same technology, and the only difference is the number of laser diodes in each. The classification mentioned in the FDA letter, are that the Capillus 82 (and the rest of the home laser domes and helmets) are approved only for women and men with mild to moderate hair loss. 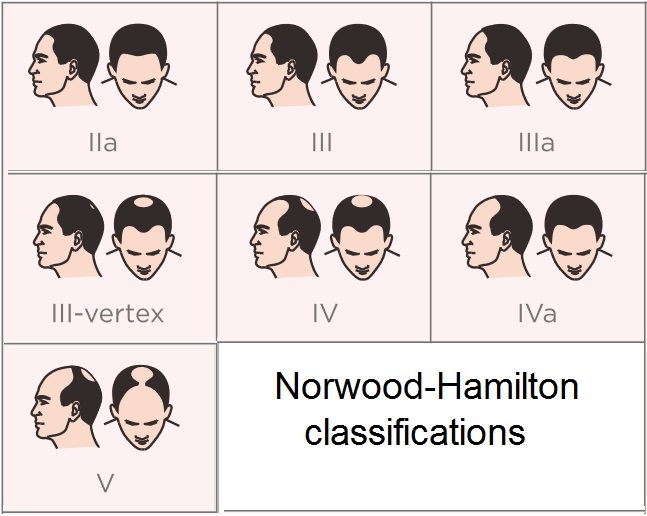 The Ludwig Scale describes the female hair loss patterns and the Norwood-Hamilton Classifications describes the males. Since hair loss is a visual issue, the two scales are a unified way to describe the progression of the hair loss. 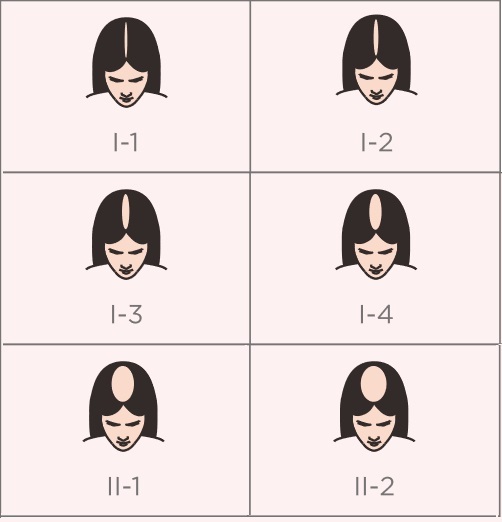 Below you can see the types of female hair loss which the Capillus laser caps are approved to treat. And below the Norwood-Hamilton types of hair loss patterns for males, which the Capillus are FDA cleared for. For advanced balding situations (in men and women) home based devices are not approved. When buying a laser hair growth system, make sure to follow the recommended treatment plan and follow the manual safety advise. No FDA clearance is relevant when the user decides to hack the machine or do stupid stuff like stare into the laser diodes or use the cap not as intended. One additional Tip – Try to trim your hair, so the laser light can reach your scalp. 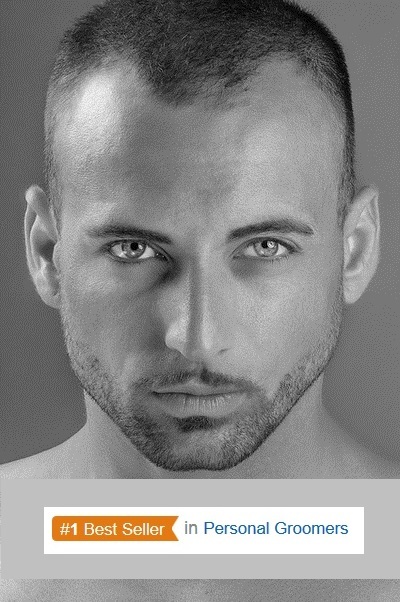 It might not be comfortable at first for those with thinning hair, but it will be more effective in the long run. To see more permanent long lasting results the laser needs to reach the skin, if the present hair is masking the laser then the results would be less prominent than you can achieve. Screenshot from the Capillus intro-video showing a real hair growth result at the back of a women’s head. Capillus Before and After picture. The Capillus 202 is the most advanced OTC (over the counter) cap you can get at Amazon. With more lasers inside than any other device, and all the upgraded features of being portable and casual looking. The price is the most obvious con of the system, it’s $1999 (as of April 2017) probably above the reach of most people. The Capillus 82 users will enjoys more lasers than the helmets and combs, enjoy a fully portable solution with a casual designed cap, and pay less than the Theradome. Click here to read reviews and ratings of the Capillus 82 laser cap at Amazon. It is worth to take self picture before you begin your 17 weeks treatment plan. This way you will have a something to compare with when you complete the treatment. These picture have lots of value for other people who seek to see if these laser caps are effective. So each new image added is always welcomed at Amazon and anywhere others can review them. This entry was posted in Capillus, iRestore, Theradome and tagged Best Hair Growth Laser Sysetm, Capillus 202 Laser Hair Growth Cap, Capillus 82 Before and After, Capillus 82 Laser Hair Growth Cap, iRestore Laser Hair Growth System, Laser Hair Growth Comb, Laser Hair Growth Hat, Laser Hair Growth Helmet by . Bookmark the permalink.